Lalibela was one of the Kings of the Zagwe Dynasty during 12th century; His regime is accredited for building the Rock churches inside the city of Lalibela formerly known as ‘Roha’. The group churches of Lalibela are considered as the unofficial 8th wonder of the world by different historians; the king and his followers carved 11 extensive complexes of rock churches divided in three different groups. There are several religious festivals that take place in Lalibela the famous ones are the Ethiopian Christmas on January 07th and the Epiphany on January 18th and 19th. 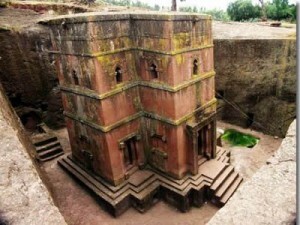 Rock churches are not only limited to the town of Lalibela, there are many churches in the vicinities built by the predecessors and successors of King Lalibela.